This shotgun was found with the stock broken in two long ago through the lock area. 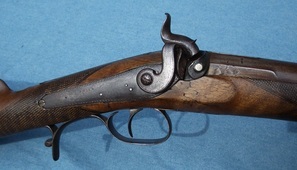 The 34" 12gauge twist steel barrel was in remarkably good order, as were the other steel parts on the gun. Each steel part was serial numbered and matched. Much of the original finish had already been stripped off when I received the parts, leaving a dry walnut stock in need of careful refinishing. A project like this is considered primarily for sentimental reasons, and not for monetary gain. I chose to undertake this project due to the relatively nice quality of the original gun, and because I loved the way the piece handled and shouldered. I like these English shotguns and think they're often under appreciated given the amount of artistry and crafstmanship that originally went into them.